The author is grateful to those who have sent in messages pointing out copy editing errors. None of these change the meaning, and certainly do not impact the thesis and propositions being argued. Nevertheless, the publisher has been informed of these changes for the next edition. The author consulted multiple Sanskrit experts on diacritic marks and found there is no standard. JNU’s Sanskrit Department and Sri Aurobindo Society’s Sanskrit researchers, for instance, use different standards. The publisher decided to remove diacritic marks because the target is mainstream, non-academic readers. At first it was decided to use italics for Sanskrit words, but this creates issues with words like “yoga” and many other loan words in English – i.e. causes too much use of italics. There are also multiple spellings in English used for certain Sanskrit words, and the choice used might not be in accordance with some Sanskrit experts while acceptable to others. Such issues are not of interest to address. The “errors” noted below concern inconsistencies and copy editing mistakes not choices of one convention over another. p. 106: Sunyata is used but index has it as shunyata. p.410: note 61: refs to Mansusmriti: 7.41, but in note 72 the style used is 3,177.
p. 442: Baudhayana, Pancavimsa Brahmana, prthak, sat-chit-ananda etc (in end notes) have diacritical markers but not other sanskrit terms. p.62 Figure: The black background in the boxes makes the text difficult to read. Index is before Bibliography – per publisher policy. p.100: The bottom boxes got switched in error between the left and right columns. p.266 opening sentence: add “(except dualistic ones)” after “dharmic systems”. p. 266: 3rd sentence: “Avidya… to satisfy” ==> add “themselves” at end of sentence. p.330: line 4: replace “ethics of” with “ethics towards”. p.349: line 3: efforts of Vandana Shiva in the ’60’s ==> should be 1970s. p.439: note 25: delete “therefore and” and insert comma after “exist”. 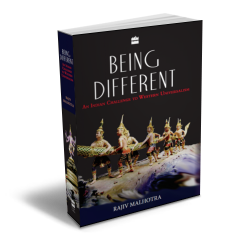 Ramanuja, the 12th century challenger to Adi Shankara, is mentioned several times in Appendix A and also on page 106. The indexer left out all the references to him in the appendix. The copy editor added “Srinivasa” before his name in error on p. 106. The second person is A.K. Ramanujan, the late professor at University of Chicago, who is cited in the book several times for his ideas on the contextual nature of dharma and Indian outlook in general. The entries in the index for A.K. Ramanujan are correct but the one on p. 121 was missed.